One of my favorite things about Silhouette is that you can use any font downloaded on your computer in Silhouette Studio. There are literally thousands of downloadable text and dingbat fonts available - many of them for free. 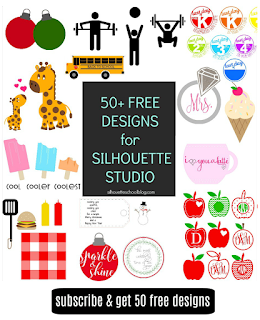 I have written several tutorials on using fonts and dingbat fonts as free designs in Silhouette, but I want to apologize, because apparently I was putting the cart before the horse. This was brought to my attention in a question from a reader named Lisa. "I'm not very computer savvy, so I having problems getting these dingbat images in my silhouette library. Could you break it down into a few more steps?? " Sure, Lisa and I'm sure you're not the only one who could use a refresher. 1) If you're looking for something very specific, say a Disney Dingbat Font, I always start with a google search. I type in something like 'Disney Dingbat Font." Usually something on DaFont.com or FontSpace.com will turn up towards the top of the search query. You'll get a preview of the font there and you can either download or keep on searching. 2) If you're looking for a specific style do a search on the font website. I always start with DaFont.com because I like the way they break down their font styles. If I'm looking for a Western-style font I just click on that category and I can quickly scroll through the Western options to find what I want to download. 3) If you just need ideas of cool fonts and awesome font combinations, I like to do a Pinterest search for 'free fonts.' I actually have a board devoted exclusively to fonts for my favorites. 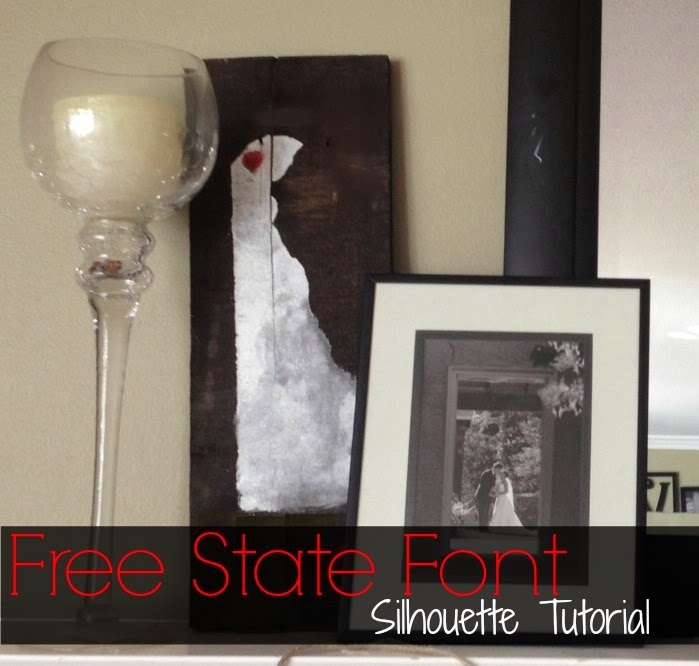 I recently did a tutorial here on Silhouette School about using a free US State dingbat fonts, so I'm going to use that example to show you how to download the font and get it into Silhouette Studio so you can use it as a stencil or a cut file. I clicked on the name of the font to be taken to the full set and there I clicked 'Download.' Take note of the licensing information - personal or commercial use is important! 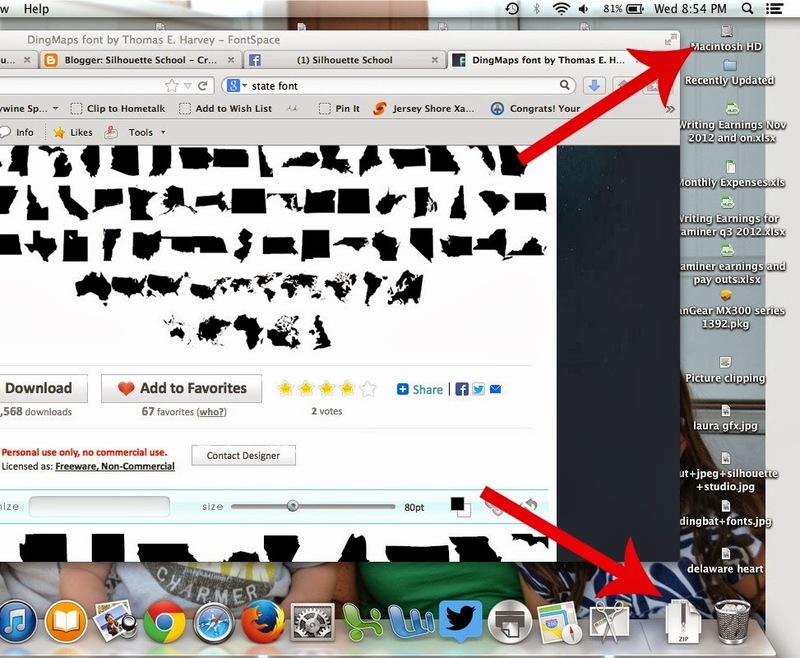 On a Mac, once you click download, you'll get a little pop up window like this. 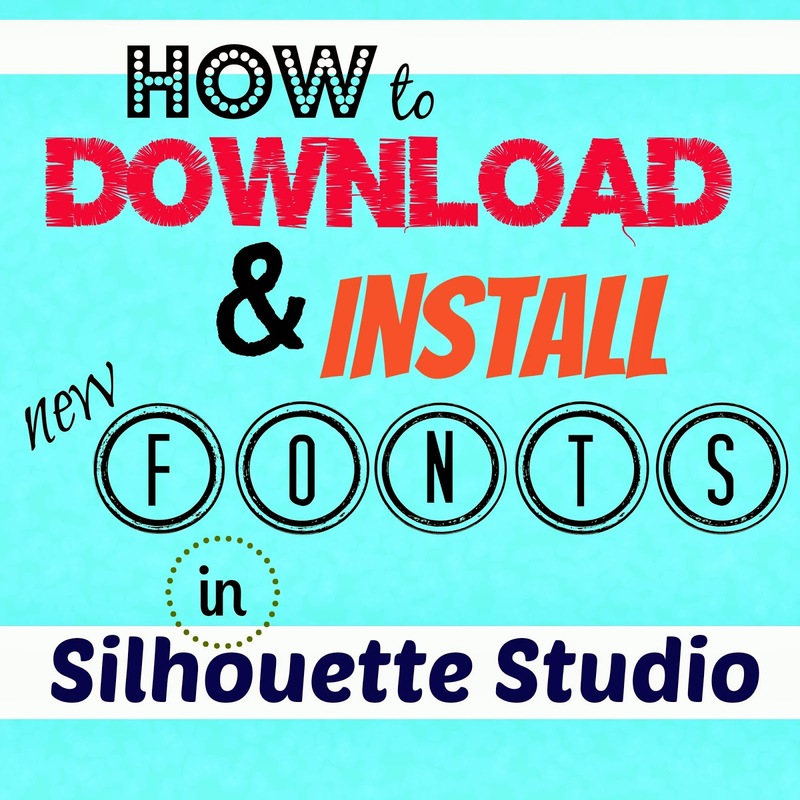 If you have Windows, see here for installing fonts (then pick up this tutorial towards the bottom for finding your new fonts in Silhouette). Click 'Ok' and the font will go onto your computer in a zip file. On my Mac, my recent downloads show up at the bottom of my screen. If you don't have this little icon, you can navigate to your download folder. 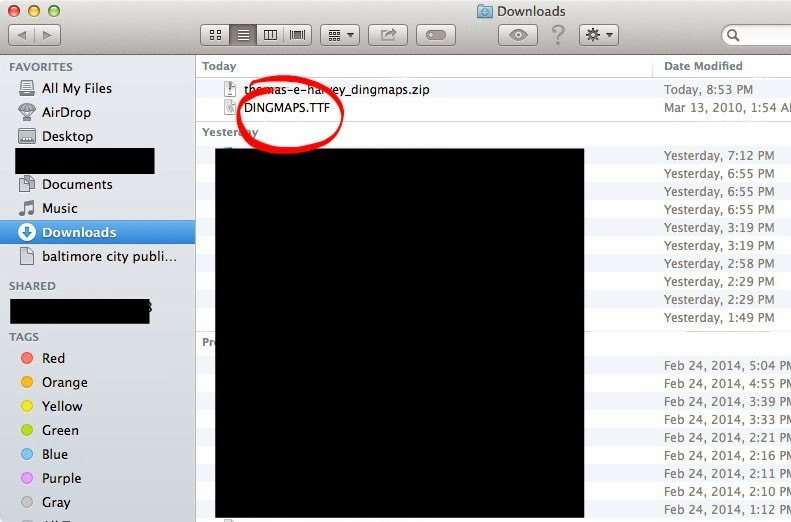 It can most likely be found by clicking the Macintosh HD icon > Downloads. When you find the zip file, click it to unzip the font file. Double click it and you're taken to yet another pop up window asking if you want to install the font. (AMEN!) Yes, by this point you definitely want to install the font into your font book. 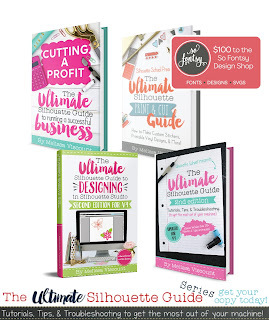 And there's your font successfully downloaded, installed and listed in your font book! Only after you've done this should you open Silhouette Studio. If you had Silhouette open while you were downloading the font, restart the program or the font won't show up. Using the text tool, type something. 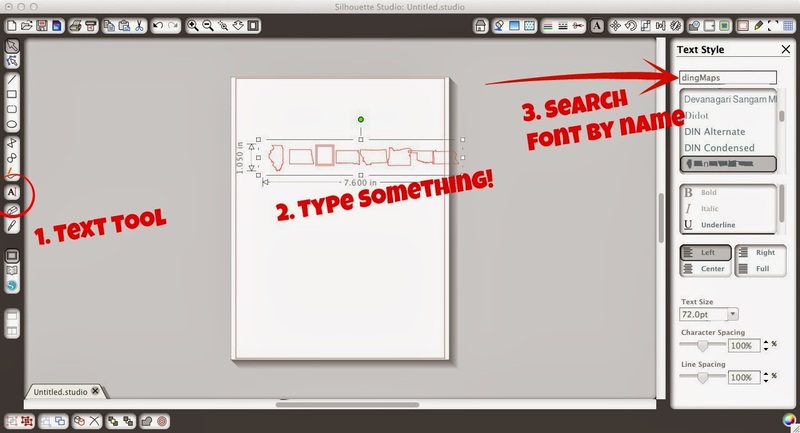 On the right side of the text window search for the name of your font, select it and you're all set! A quick tip..dingbat fonts often use upper and lower case letters and sometimes numbers for characters and designs so be sure you're using both. 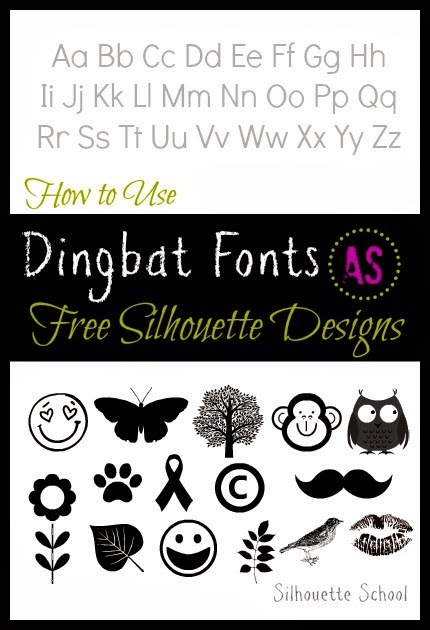 Don't forget to check out our tutorial on using dingbat fonts as free designs in Silhouette Studio. Do you have a step by step for windows? 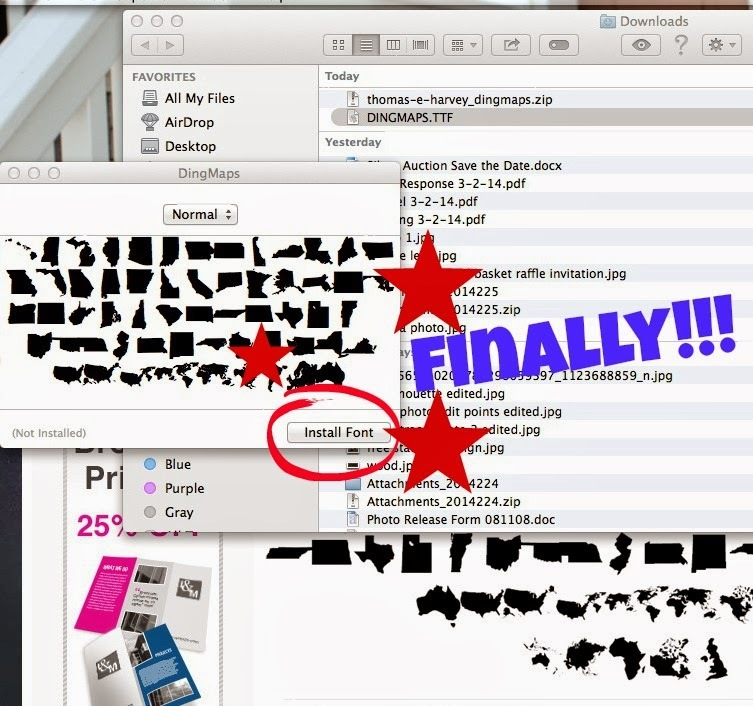 I cannot get free fonts to download into V3 like they did with V2.... unzip, import to library, choose file, viola! No such luck anymore... thank you!!! I'm in the same situation...I've been trying to download from Dafont.com and none of what I'm getting asks me if I want to upload to fonts, etc as it says here in the tutorial. Back to the searching for answers! Thanks for the great tutorial. Is there a way to figure out which font was used in a particular project? I have created projects with fonts, and gone back later to see what font I used. When I select the text, under 'Text Style' on the right it just shows me the first font in the list (usually ARIAL). Really frustrating when I'm trying to duplicate the font in another project. Thanks so much! 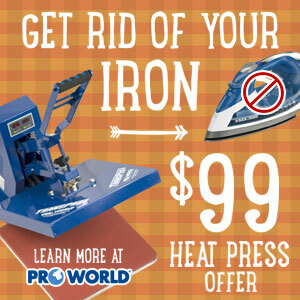 Your font is no longer a font after you weld and get it ready to cut. So, any project that you do ,keep a notebook or copy paste to the side before you do too much. 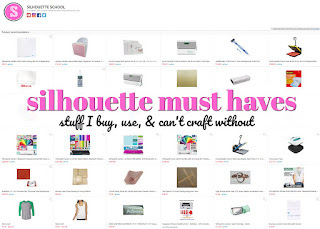 I bought fonts from the Silhouette site and they say that they will be automatically added to my fonts, but they aren't. I contacted Silhouette and they told me to make sure that all my apps have permission to read and write. I did that and downloaded the fonts again, but they're still not showing up. Any ideas? I have the same question, Melissa.Does anyone out there know if there issomething else we need to do to get the purchased fonts into other programs? Good news! 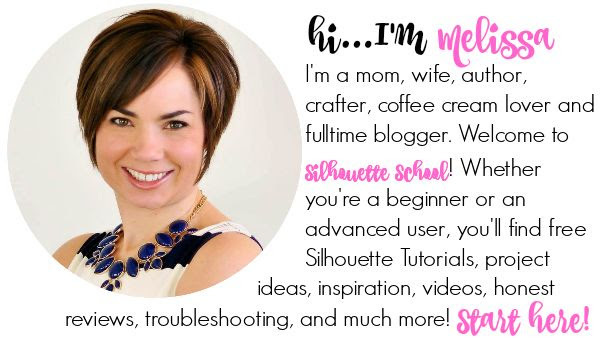 After posting this, I closed my Silhouette Studio and was presented with a window asking if I wanted to install the purchased font. After saying YES, the font is now available in my other programs! Problem solved! 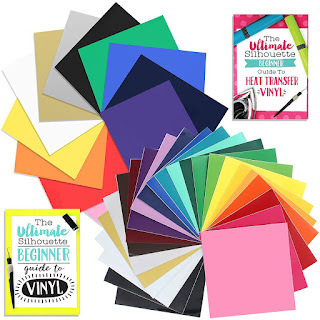 How do you get the fonts that are already loaded into Silhouette and/or that you get off of dafonts.com to be sketch fonts instead of cut fonts (outline)? I guess what I'm trying to say is how to make the font look like a pin instead of just outline fonts? My problem isn't using the fonts, but when I export as a pdf file or as a jpg, the fonts are no longer part of the artwork/graphic. hi can any-one HELP ME! I'm trying to change my fonts into rhinestones!! ie / the alphabet! I have been adding new fonts all evening with no problems. I am trying to install the "Mickey Ears" font. It is working everywhere else on my computer but will not load into the Silhouette Studio. Has anyone had a similar problem? Does anyone know a solution? Any help would be very appreciated!! Pam, How were you able to get the Mickey Ears font in Silhouette Studio? I am having the same issue. 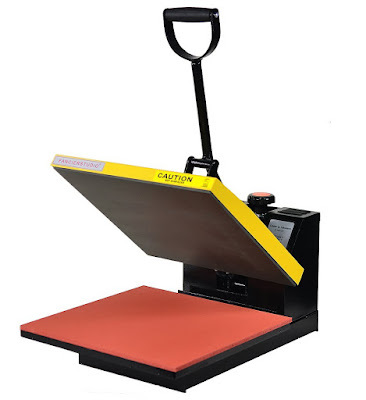 It shows up everywhere else but not in Silhouette Studio. I need it for a project due soon. Please help! Is there a way to take a drawing that I done and cut it on the silhouette. I have already scanned into my computer to a file. So how would I make it a silhouette file? OK...I have read and followed this letter by letter and I still can't get them downloaded....find them on my Mac and import to my Library!